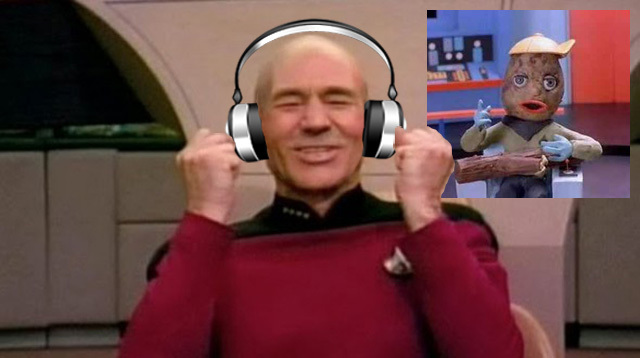 Picard Of The Pops: Star Trekkin' | Warped Factor - Words in the Key of Geek. The novelty act is something of a staple in pop - firmly rooted in the category of so bad it's good! 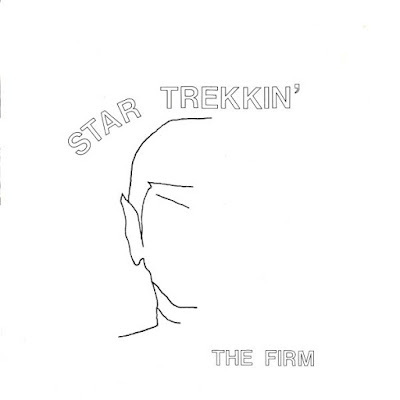 The best example of that in a Trek context, outside of Spizzenergi with Where's Captain Kirk, must be The Firm's Star Trekkin', knocked up by guitarist John O'Connor after tweaking Arthur Daley E's Alright - a Chas & Daveesque tribute to the man from Minder. Mercifully eventually shying away from a simple Captain Kirk E's Alright, 1987 would find them unleashing what appears to be little more than a barrage of catchphrases set to music, forced to release the result on their own label after a lack of interest from anywhere else. Bark Music's original print of 500 copies saw the track break into the UK Top 75 - at number 74! But it did at least find an appreciative enough audience among several radio disc jockeys, among them Radio One's Simon Bates, and after he promoted the single it climbed to number 13. Two weeks later it was number one and went on to sell more than 470,000 copies, making it the ninth biggest selling single of 1987. "Ron Spock" (as O'Connor billed himself) & friends vindicated! Its origins lie with The Music Man, and an English Civil War re-enactment society known as the Sealed Knot. Fellow Firm man Rory Kehoe was a member, & improvised his own take, I Am The Star Trek Man, around campfires for the amusement of his fellows. The tempo of what would later emerge is said to take its cue from no less than Rolf Harris' The Court Of King Caractacus. "One of the greatest highlights of my career was producing Star Trekkin. The record was produced to mock the series and we had no idea it was going to be a big hit. We tried to sell it but no other company would touch it, so John released it under his own record company and it went on to beat Whitney to the no1 spot." Whitney is of course the late Ms Houston, & I Wanna Dance With Somebody. Boldly going forward 'cause we can't find reverse. It's life, Jim, but not as we know it, not as we know it, not as we know it; it's life, Jim, but not as we know it, not as we know it, Captain. Well, it's life, Jim, but not as we know it, not as we know it, not as we know it; it's life, Jim, but not as we know it, not as we know it, Captain. ye cannae change the laws of physics, laws of physics, Jim. there's Klingons on the starboard bow, starboard bow Jim! Ya cannot change the strength Jim of the engines. A rather large helping of cheese, there.